Easy access to left or right hand controls. 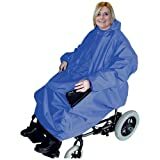 This waterproof rain cover is ideal for use on power assisted wheelchairs. Designed to keep you and your wheelchair dry with its foldaway hood, elasticated cuffs and velcro slots to accommodate left or right handed controls. It is also available in maroon and grey.